Bradford cleared waivers Monday, making him a free agent, Field Yates of ESPN reports. Bradford was released by the Cardinals on Saturday, Adam Schefter of ESPN reports. Bradford (coach's decision) is inactive for Sunday's contest against the Seahawks, Josh Weinfuss of ESPN.com reports. Analysis: As expected, Bradford has yielded the No. 2 job to Mike Glennon after losing the starting QB gig to Josh Rosen last weekend. Unless something happens to the duo, Bradford seems destined to be deactivated on game day for the foreseeable future. Bradford is expected to be the Cardinals' No. 3 quarterback moving forward, resulting in inactive status on game days, Adam Schefter of ESPN.com reports. Analysis: The Cardinals won't officially confirm their Week 4 inactives until about 90 minutes before Sunday's 4:05 PM ET kickoff, but Bradford seemingly will be wearing street clothes with the Seahawks in town. Coach Steve Wilks will thus trust in Josh Rosen as the starting quarterback, with Mike Glennon backing up the 2018 first-round pick. Bradford (pectoral) doesn't have a designation for Sunday's game against the Seahawks, Darren Urban of the Cardinals' official site reports. Analysis: As if getting demoted to backup quarterback behind a rookie wasn't enough, Bradford dealt with a pectoral injury this week, limiting him Wednesday and Thursday before taking every rep Friday. He'll enter the weekend with a clean bill of health, but snaps on Sundays will be difficult to come by unless something befalls Josh Rosen. Bradford was a limited practice participant Wednesday due to a pectoral injury, Darren Urban of the Cardinals' official site reports. Analysis: Bradford's health isn't much of a concern for the Cardinals now that Josh Rosen has been promoted to the No. 1 job. The team may opt to move forward with Mike Glennon as the backup quarterback on game days rather than paying Bradford a sizable bonus for each week he's on the active roster. Bradford has lost the starting job to Josh Rosen, Darren Urban of the Cardinals' official site reports. Analysis: Bradford put up just 20 points and committed six turnovers in three games, eventually getting benched during the fourth quarter of Sunday's 16-14 loss to the Bears. It remains to be seen if he'll be active for Week 4 as the backup quarterback, given that the Cardinals can avoid some of his roster bonuses if he isn't on the 46-man gameday squad. It would be cheaper for the team to use Mike Glennon as the backup for Sunday's game against Seattle. 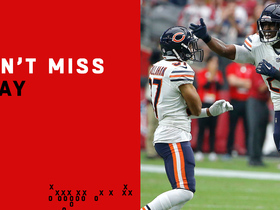 Bradford was replaced by Josh Rosen in the fourth quarter of Sunday's 16-14 loss to the Bears, finishing 13-for-19 passing for 157 yards with two touchdowns, two interceptions and a lost fumble. 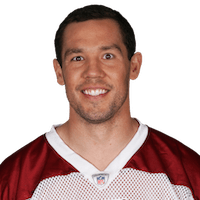 Head coach Steve Wilks confirmed that Bradford will remain the Cardinals' starting quarterback, Kyle Odegard of the Cardinals' official site reports. "Sam's the guy," Wilks said Wednesday. Coach Steve Wilks declined to commit to Bradford as the starting quarterback for Week 3 against Chicago, Kyle Odegard of the Cardinals' official site reports. Analysis: Wilks didn't actually say anything specific when asked about the quarterback situation, sticking with the typical coach's statement of "everybody will be evaluated." Bradford struggled through another awful outing in Sunday's 34-0 loss to the Rams, completing 17 of 27 passes for 90 yards and an interception. With Josh Rosen waiting in the wings and Arizona's season seemingly going nowhere, Bradford will be on a short leash even if he does keep the starting job for another week. Bradford completed 20 of 34 pass attempts for 153 yards with no touchdowns and an interception in Sunday's 24-6 loss to Washington. Analysis: Bradford passed for just 11 yards in the first half, while leading the offense to a measly two first downs. 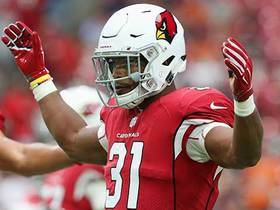 It didn't get much better in the second half, as the Cardinals did not score until late in the fourth quarter on a David Johnson touchdown run. 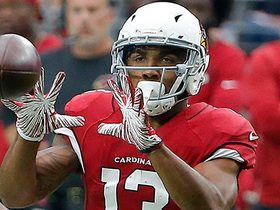 On the bright side, Bradford showed a strong connection with Larry Fitzgerald, as the duo hooked up seven times for 76 yards. The veteran quarterback probably won't find things easier Week 2 with the Rams on the schedule. Bradford enters the 2018 season in good health, Josh Weinfuss of ESPN.com reports. "I know that right now, it does feel as good as it has felt in a long time," Bradford said of his knee Wednesday. Bradford played the first two drives in Sunday's 27-3 preseason win over the Cowboys, completing one of four passes for six yards. Analysis: Bradford saw limited action while top skill-position players David Johnson and Larry Fitzgerald sat out entirely. Mike Glennon and rookie Josh Rosen (thumb) don't appear to be serious threats to Bradford's starting job heading into the Sept. 9 season opener against Washington. Bradford completed each of his six pass attempts for 61 yards in Friday's preseason game against the Saints. Bradford will play more than a series in Friday's preseason game at New Orleans, Darren Urban of the Cardinals' official site reports. Bradford played 10 of 54 offensive snaps during Saturday's 24-17 preseason win against the Chargers. Bradford will play in Saturday's preseason game against the Chargers, Darren Urban of the Cardinals' official site reports. Analysis: After endearing a cap on his practice reps throughout the offseason program, Bradford has been running the first-team offense since training camp opened July 28. The decision by coach Steve Wilks was a logical one due to Bradford's injury history, namely regarding his left knee. Wilks wouldn't divulge how many snaps or series Bradford will take on Saturday, but it likely won't be much with 2018 first-rounder Josh Rosen, Mike Glennon and Chad Kanoff all waiting in the wings. Bradford has been a full-go during training camp and taken all first-team reps, Darren Urban of the Cardinals' official site reports. Bradford participated in team drills during mandatory minicamp last week, Josh Weinfuss of ESPN.com reports. Bradford is expected to increase his reps at mandatory minicamp next week, Darren Urban of the Cardinals' official site reports. "Today was a good day in terms of an operational day for us, and he didn't get any of that work," coach Steve Wilks said after Tuesday's OTA practice. "Next week, those are some of the things we are trying to get him in the mix." While he still expects Bradford to be the starting quarterback, Cardinals coach Steve Wilks noted that "every position is open for competition", Kent Somers of The Arizona Republic reports. "We got Sam to be our starting quarterback and I would still say that is the case," coach Steve Wilks said. "I'm very excited about Josh, what he can bring. Every position is open for competition." Analysis: Wilks seems to be leaving the door open for Josh Rosen, who the Cardinals selected at No. 10 overall after trading up with the Raiders. The outcome was far from ideal for Bradford, as Rosen was once viewed as a likely top-five pick and possible Day 1 starter. Based on Wilks' comments, a training camp battle figures to ensue. Bradford made some throws during the open portion of Thursday's minicamp practice, Josh Weinfuss of ESPN.com reports. Bradford didn't throw Tuesday, which marked the first day of the Cardinals' voluntary minicamp, Kent Somers of The Arizona Republic reports. Bradford made his two-year contract with the Cardinals official Friday, Kyle Odegard of the Cardinals' official site reports. Bradford intends to sign with the Cardinals, Adam Schefter of ESPN reports. Bradford was able to ski last week, but Vikings head coach Mike Zimmer suggested the quarterback's left knee is still considered degenerative, Tom Pelissero of NFL.com reports. Bradford completed 32 of 43 passes for 382 yards, three touchdowns and no interceptions over two games for the Vikings in 2017. Bradford will serve as the Vikings' backup quarterback in Sunday's NFC championship game at Philadelphia. Analysis: For the second week in a row, Bradford has usurped Teddy Bridgewater as the top reserve option to starter Case Keenum, who has handled most of the offensive snaps among Vikings QBs since Week 2. Bradford (knee) is listed as active for Sunday's playoff game against the Saints, the St. Paul Pioneer Press reports. Analysis: Bradford, who came off IR on Saturday, is thus slated to serve as Case Keenum's backup Sunday, while Teddy Bridgewater, who had worked as the team's No. 2 QB down the stretch, was made inactive by the Vikings. Bradford (knee), who was activated from injured reserve Saturday, is expected to serve as the top backup to starter Case Keenum during Sunday's divisional-round matchup with the Saints, Chris Mortensen of ESPN reports. The Vikings activated Bradford (knee) from injured reserve Saturday, Courtney Cronin of ESPN.com reports. Analysis: It seems likely that Bradford will suit up, but it remains to be seen where he will sit in the pecking order behind starter Case Keenum. His activation may indicate the Vikings feel more comfortable with him as the No. 2 quarterback, given that Teddy Bridgewater has not played any meaningful snaps since the 2015 season. The Vikings plan to activate Bradford (knee) from injured reserve Saturday, Tom Pelissero of NFL.com reports. Analysis: The Vikings haven't made an official move yet, but it appears Bradford will be on the active roster for Sunday's playoff game against the Saints. All signs still point to Case Keenum starting the contest, but the team may feel more comfortable with Bradford as the No. 2 over Teddy Bridgewater. Coach Mike Zimmer indicated that he hasn't made a decision on whether Bradford (knee) will suit up for Sunday's playoff game against the Saints, Courtney Cronin of ESPN.com reports. Analysis: In order for Bradford, who practiced again Friday, to be in uniform for the contest, the Vikings would need to activate him off IR and make a move to clear space for him on the team's 53-man roster. Either way, Case Keenum will start Sunday's game, with Teddy Bridgewater also in Minnesota's backup QB mix. Bradford (knee) practiced for a second consecutive day Wednesday, Craig Peters of the Vikings' official site reports. "It's been a progression," Bradford said. "We put a lot of hard work in. ... I felt very confident going into these practices that it would feel good, and I think it responded well after yesterday, and I was able to go out there again today and practice." Bradford (knee) was on the field Tuesday for the Vikings in their first practice of the postseason, Andrew Krammer of the Minneapolis Star Tribune reports. "I just want to see where [Bradford is] at," Vikings head coach Mike Zimmer said Monday. "How he's moving, things like that. I hear he's moving good. I hear he's throwing the ball good. But that's all I do is hear. We'll just go about it and see how it goes." Vikings head coach Mike Zimmer said Wednesday that he anticipates Bradford (knee) returning to practice next week, Courtney Cronin of ESPN.com reports. The Vikings placed Bradford (knee) on injured reserve Wednesday. The Vikings are expected to place Bradford (knee) on season-ending injured reserve Wednesday, Ian Rapoport of NFL Network reports. Bradford underwent arthroscopic surgery on his left knee Tuesday. Bradford had surgery on his left knee Tuesday performed by Dr. James Andrews, who "cleaned up" the knee in hopes of easing pain and discomfort, Chris Mortensen of ESPN reports. Analysis: Even if this was a minor procedure, it doesn't sound like Bradford is coming back anytime soon, and the Vikings may decide to put him on injured reserve. With Case Keenum thriving in Bradford's stead as the Vikings' starting quarterback and Teddy Bridgewater (knee) set to return from the Physically Unable to Perform list this week to provide additional insurance at the position, Minnesota may not have much incentive to waste a roster spot on Bradford while his return timeline remains murky. Bradford will visit Dr. James Andrews on Tuesday for a second opinion on his injured left knee, Tom Pelissero of NFL.com reports. Vikings general manager Rick Spielman told SiriusXM NFL Radio on Wednesday that Bradford (knee) is "getting healthier and has made some progress this week," but the team has yet to issue a definitive timetable for the quarterback's return. 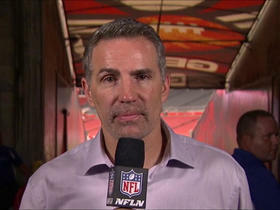 NFL Network's Kurt Warner discusses the Arizona Cardinals starting quarterback Josh Rosen over Sam Bradford in Week 4. 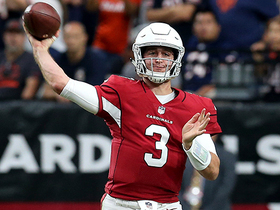 NFL Network Insider Ian Rapoport explains why the Arizona Cardinals decided to start quarterback Josh Rosen over Sam Bradford in Week 4 against the Seattle Seahawks. 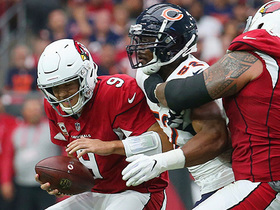 Chicago Bears linebacker Khalil Mack sacks Arizona Cardinals quarterback Sam Bradford for a loss of 7 yards. Arizona Cardinals running back David Johnson rushes for 12 yards and a first down. Arizona Cardinals quarterback Sam Bradford throws to wide receiver Christian Kirk for a 32-yard catch. 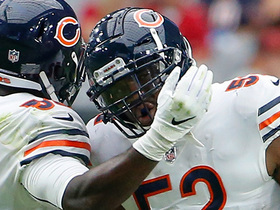 Chicago Bears linebacker Khalil Mack forces a fumble by hitting the ball out from Arizona Cardinals quarterback Sam Bradford's hands. 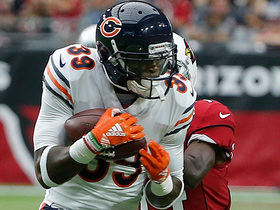 Chicago Bears linebacker Danny Trevathan hops on the ball for the Bears. 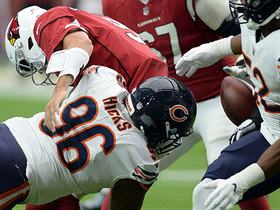 Chicago Bears defensive tackle Akiem Hicks sacks Arizona Cardinals quarterback Sam Bradford to force a fumble but Arizona Cardinals running back David Johnson recovers the football.